Yesterday saw the first game at Arena da Amazonia, the stadium initially opened by president Dilma Rousseff in mid-February. Both occasions have one thing in common: works still haven’t finished. A few weeks later than planned in early 2014, Arena da Amazonia yesterday enjoyed its first official game. The local class between Remo and Nacional (2:2) was watched by nearly 20,000 people. Because this was a test event, only the lower tier was opened for regular spectators. 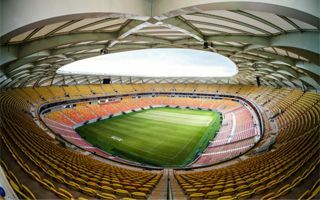 Scheduled for delivery in December 2013, the stadium in Amazon metropolis of Manaus suffered from major setbacks. First game was to be held in mid-February, but after a fatal accident taking the live of third worker, the game was postponed. Instead, president Dilma Rousseff came to Manaus on February 14, kicking the ball for the first time. Both occasions had one important thing in common: the stadium wasn’t completely ready while they took place. While all systems generally work as they should, finishing works and adjusting the ground to FIFA’s needs are still ongoing. Just like yesterday’s game, the ceremony with Brazilian president was accompanied by strict security measures as people protest excessive spending for the World Cup venues. Some 2,500 police officers were deployed yesterday to safeguard the first open event. Arena da Amazonia will be Manaus’s most important stadium, holding some 46,000 people. During the World Cup capacity will be reduced to just over 42,000. Not only opened much later than expected, the stadium also proved more expensive than anticipated. Priced at R$ 499 million, it’s now over the R$ 605 million mark (€186m / $258m).